Growing Up in the Two Koreas – Patrick F. Clarkin, Ph.D. 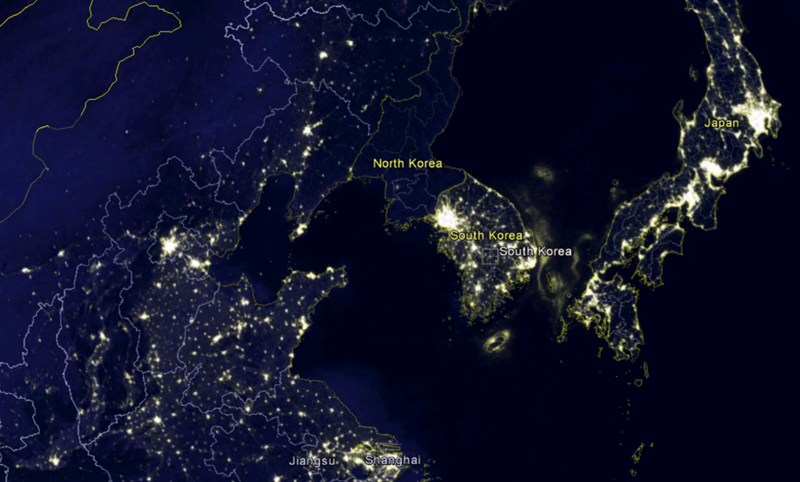 The above image of east Asia at night is worth more than a thousand words. Below the 38th parallel is the birthplace of my mother-in-law in South Korea, which is luminescent at night as the result of its highly developed economy. My father-in-law was born above that line in North Korea, which today appears to be little more than a shadow of its southern neighbor. Even if one knew nothing about history or geography, they could infer from that single satellite image that there must be a chasm in living standards on either side of the border. A full history of the two Koreas and the war of 1950-53 is beyond the scope of this post. What is relevant is that the forces of history and politics took a once cohesive nation and cleaved it in two, having disparate effects not only on the ideologies on either side, but also on the physical bodies of the respective inhabitants. It’s almost as if someone collected a population of dandelions from a single field and then placed them in two different greenhouses for six decades, replete with different soil quality, sunlight, and temperatures, and then observed how they fared. By now, many people have heard something about how North Koreans are significantly shorter than their southern cousins, implying that, like our dandelion example, the conditions for physical growth are quite different in the two greenhouses. John McCain even mentioned this during the 2008 presidential debates to illustrate North Korea’s brutality toward its citizens. How true is this claim? There are at least two ways for the average physical stature of a population to change over time. The first is via genetic evolution over fairly long expanses of time. For example, modern humans are much taller on average than chimpanzees or early hominins such as Orrorin or the australopithecines (McHenry and Coffing 2000; Nakatsukasa et al 2007). The second way occurs over relatively short periods – a few generations – stemming from our developmental plasticity and ability to respond to fairly rapid changes in economic, ecological, or nutritional conditions. In human biology, these are known as ‘secular trends’ in growth. (Note that the word ‘secular’ in this case has nothing to do with religiosity, but it plays off the alternate meaning of ‘sacred’ as eternal, whereas secular is something that occurs in observable time). It is likely that there is a third important way that populations change over time, via epigenetic inheritance and ‘phenotypic inertia’ (Kuzawa 2005). But that is a story for another day. Although historical data can be tricky and must be pieced together carefully, secular trends in average population height, weight, or even sexual maturation such as age at menarche, have been observed to occur relatively rapidly (Steckel and Rose 2002; Euling et al 2008). One of the more commonly cited examples is that the Netherlands has gone from one of the shortest countries in Europe to one of the tallest in the world in roughly a century (Bilger 2004). Many countries have seen similar upward changes over time as their economies and public health measures have improved, including South Korea. It’s northern counterpart, however, has not fared nearly as well. Sunyoung Pak and Daniel Schwekendiek (a biological anthropologist and an economist, respectively) have published extensively on the differences in growth between North and South Koreans. 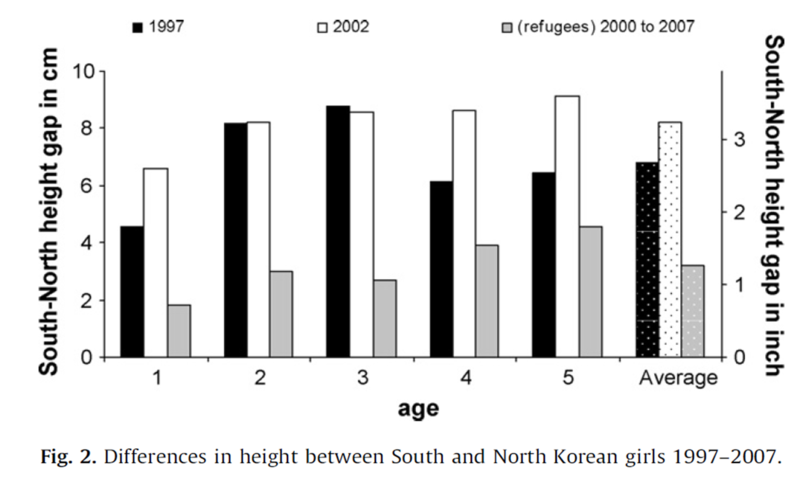 Pak (2004) compiled height data from the medical examination records of 2,384 North Korean adults who had fled to the South between 1999 and 2003. These data were then compared to a South Korean reference. It is difficult to imagine a more stark contrast. 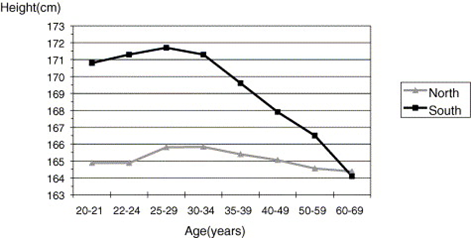 The above figure illustrates how height has changed between South and North Korean men over time (the same trend was found in women as well). For the older men, who were born in the 1930s before the division of the country, heights were nearly identical between North and South. However, as subsequent generations found themselves in increasingly different environmental conditions, the disparities in height between the two groups grew remarkably. South Koreans had a marked secular increase in height, whereas the North Korean trend was minimal. There was some concern that this study could be misleading because its sample from the North was made entirely of defectors who were possibly not representative of the population as a whole. However, in 1997 and 2002 the United Nations conducted two independent nutritional surveys within North Korea itself (Schwekendiek and Pak 2009). From those studies, it was found that young North Korean children were about 6 to 8 cm (2 to 3 in) shorter than those in the South. And keep in mind that those children measured in North Korea were those fortunate enough to survive famine and extreme poverty. It is necessary to point out that these trends were set in motion before the famine in the 1990s which claimed the lives of up to one million North Koreans. That famine appears to have resulted from a combination of factors, including natural disasters, deficiencies in food production and distribution, and the loss of support from the defunct Soviet Union (Schwekendiek, 2008). Today, hunger-related deaths are still occurring, resulting from a new suite of factors, including government policy decisions and consequent price shocks (Haggard and Nolan 2009). By comparison, U.S. military spending – despite its astronomically high figure in absolute terms – has been about 3 to 5% of GNP over the last two decades. Of course, military spending will always have opportunity costs for any nation, not just North Korea, since those resources cannot be invested elsewhere, such as infrastructure, public health, education, human development, etc. But North Korea is a special case since it puts such a high percentage of its resources into its military, and because its leadership believes it is still fighting for its existence in a war that never officially ended. It is also isolated, Orwellian, and extremely repressive, and that confluence of attributes does not bode well for its population. Elsewhere, Schwekendiek noted that the North Korean government’s attempt to influence its image as a prosperous nation to the rest of the world by releasing dubious statistics on health and economics are negated by objective data on the growth of its population (as well as many other pieces of information). The human biologist/physician James Tanner once referred to physical growth during childhood as a mirror for “the material and moral condition” of a society (Tanner 1986: 3; Tanner 1990). By those criteria, the conditions in North Korea are found severely lacking. One wonders if the recent death of Kim Jong-il will lead to changes in those conditions, though it seems unlikely that the gap in physical growth between North and South will be closed anytime soon. Tanner JM (1986) Growth as a mirror for the conditions of society: secular trends and class distinctions. In Human Growth: A Multidisciplinary Review. Arto Demirjian and Micheline Brault Dubuc, eds. Pp. 3-34. London: Taylor and Francis. This entry was posted in Human biology, Human growth, War and health and tagged Korea, secular trend. Bookmark the permalink. A fascinating picture. It would be interesting to see the whole world in this light – or lack of it as the case may be. Whether electricity-use relates to nutrition – the substance of the article – must clearly be taken with caution. The malnourished will not resolve their problem by leaving the lights on! But the general hypothesis that electricity use is one indicator of human development, along with malnutrition rates, literacy, mortality at childbirth, drinking water supply, and all the factors in the UN Human Growth development Index, is logical and ever since measurement has been seriously undertaken (around 60 years in some places) it is clear that development is a package – things do tend to advance (or retreat) together. Of course, so do the number of motor vehicles, TVs, computers, pollution, and everything else that tend to make strolling the supermarket lanes our height of activity. Face to face human interaction also declines and is not compensated by Facebook or Linked-in. Win some lose some. That all people in a situation of reasonable nutrition in their early years are getting taller is evident to me subjectively and objectively. I am 6 foot 1”. At school in England I was nicknamed lofty. Kids asked what the weather was like up there. It wasn’t hard to stand out in those days. My father, a colonial, was also tall in his time, 5’10” if I remember – today’s medium height. As a teenager in Malaya (sia) and in Bangkok, taking a bus always meant standing because my legs wouldn’t fit between seats, and unless I could locate my head in one of the air vents, standing meant bowing my head and back, and still all the natives were under my sweaty armpits. Now in the same places even the buses have changed height and if I can find a seat I sit, if I stand I don’t have to worry about my hair-do – and air-conditioning means no sweaty arm pits. Doing my doctoral fieldwork in Hmong villages, my head was constantly bruised and battered since all house cross beams were above normal head height – about 5’. When I later went back to live in Laos I was still Gulliver in Lilliput – the whole country was coming out of a 30-year conflict, pigmy against pigmy. Of course food was scarce for everybody, and although parents feed their children before themselves (a universal factor, Victorian England excepted) the food available was inevitably rice and rice, with, as a treat, noodles – made from rice. I won’t go into what a can of condensed milk was worth. Later I was in charge of highlander camps on the Lao-Thai border. Just about all of the Hmong children under 5 had some degree of malnutrition. This was blamed on food shortages in Laos – a reasonable assumption. But while the majority of my refugees were Hmong, there was a significant minority of Yao (Mien). I had spent time in the area of Laos both ethnic groups came from and knew they had the same life styles, wealth patterns, social patterns etc and both grew opium and rice. Yet Yao children measured significantly less malnutrition than Hmong. Yao adults were also significantly taller than Hmong. In a closed camp it was very evident – like Tolkien’s elves and hobbits, the Hmong being the hobbits. In the camp everybody got the same carefully measured diet and some families stayed there many years. Even Hmong born in camp measured malnourished and they were getting from birth a diet that westerners should go for to get in shape. Other Hmong arriving were short and under fives all measured malnutrition. The very odd thing was that ten-year old Hmong children, whether born in camp or new arrival mostly measured as in a reasonable condition, with no signs of significant malnutrition. Of course those measuring malnutrition got supplementary feeding. Conditions were not perfect for the experiment – people were leaving for resettlement or repatriation all the time – and while those getting the supplement over time improved, they also passed the benchmark figure of 5 years old, so maybe they’d have improved anyway. Back in Laos, when I returned, conditions were changing and the markets had food. Lao of whatever ethnicity didn’t shoot up overnight, and Hmong remained shorter than Yao even if they drove a Mercedes. In time Hmong Americans were born and raised in the US. A generation on, some of those children are visiting Laos on US passports. They come to my bookshop and some even say ‘you knew my father’. All are as tall as any US teenager. Some are taller than me. Their shape is also different – no offence intended but Hmong Americans today look more like Yao. Hmong born and raised in Laos today, are perhaps a bit taller but not that much. Four years back I started a large Swedish development programme in what is perhaps the most remote part of northern Vietnam, a district almost 100% Hmong – an area that on a satellite night picture would have been as black as the inside of a buffalo’s horn (any Hmong reader should understand that). Three day’s walk including two nights rest from the nearest town – that’s pretty remote. I stayed one year. Before making plans on how to spend money I conducted a baseline-survey in every one of the 32 Hmong villages, covering all factors including nutrition. The villages had been there up to 400 years and had terraces; there was no migrant or refugee factor. Food was adequate. Almost all the Hmong under-fives measured a degree of malnutrition (we used the most reliable measurements possible). My programme included supplementary feeding, although I was doubtful about its utility, and I set down plans for a comparative re-survey after 3 years, noting particularly malnutrition rates for 3 year olds i.e. born after the programme began, and 6 year olds noted as malnourished in the baseline survey. I warned at the time that ‘growing out of’ malnutrition might not be evidence of the benefits of supplementary feeding, but might relate to other factors. Unfortunately, the project’s final evaluation included no survey of any substance and therefore no conclusions or hypotheses could be made either way. The missed chances in development projects anywhere would make an encyclopaedia of ignorance. Subjectively, I do not feel tall anymore, even in Laos, although pictures suggest I and any western foreigner remain significantly taller than Lao of any ethnicity. Vientiane now has its first Swenson’s and the equivalent of Pizza Hut – Lao love them both. In the end it probably is milk (and its ice cream and cheese forms) that change the shape of people. Amazingly I can now find a pair of shoes and a shirt that fit me in Thailand – not yet in Laos, maybe another generation. Lose some win some. But back in the days of the Cultural Revolution, Chinese in the south were all incredibly short, those in Peking (Beijing) and north of the Wall were incredibly tall. Genetic stock? -It’s possible that the 10 year old Hmong children in the camps were the healthiest of the population, and thus the most likely to survive. Mortality rates were likely higher in the smaller kids who obviously could not be measured later in life. Just a guess. -Genetics. There likely are genetic variations in height that run across ethnic lines. The WHO takes the position that all children under 5, regardless of ethnicity, have the same growth potential. But just because that’s their position doesn’t make it true. I think it’s a good approach, however, because the alternative is to say that some populations are just genetically small so why bother with supplementation? According to Mercedes deOnis, the jury is still out on how this applies to older kids. Still, the search for genes related to height has been relatively fruitless. The first that was definitively related to height was reported in 2007 and was found to add only about 0.5 to 1 cm, depending on whether one had a single or two copies. Not much of an impact, so there are probably many genes involved. -Are Lao drinking raw milk today? If so, that would be fascinating since they have no history of dairy farming. I wonder how tolerant of lactose they are. For my dissertation, I asked Hmong adults if they drank milk, and many said they did today, but only in small quantities, like when added to coffee. They also said that they would drink milk as children in the Thai camps, but not Laos. When I asked if it made them sick, they said it did but they were told that in order to receive a cookie, they had to drink their milk. This likely came from well-intentioned Westerners who saw milk as healthy for children, who probably didn’t recognize that the ability to digest lactose after infancy seems to vary by ethnicity. By the way, I’m 6’2″ and according to my old physician records, my older son is taller than I was at his age. The trend continues. We’re both built sort of ‘Elvish.’ Sometimes I rather wish I were a Gondorian however, or at least a Rohanian. Beautifully written, and thoughtfully crafted. Bravo to everybody on this thread. Pingback: Syrians in the Darkness | Patrick F. Clarkin, Ph.D.